Happy 2011! I hope it's a great year for you. Santa was good to me this Christmas, dropping off three excellent books that you should add to your Disney collection as well. For 38 years, Jack Lindquist worked for the parks division of Disney. He began his career as an advertising manager at Disneyland just months after it opened in 1955 and stayed until Mickey Mouse's 65th birthday in the fall of 1993. Most of his time was spent at Walt's original Magic Kingdom, but Jack also did a significant amount of work at Walt Disney World in the 1970s and 80s before being named Disneyland's first president in 1988. In In Service to the Mouse, Lindquist recalls some of the highlights of a four decade-long career where he rubbed elbows with celebrities, world leaders and Walt Disney himself. Lindquist earned a reputation for being an innovative thinker with a tenacious work ethic. He rarely backed down from an idea he believed in, more than once putting his job on the line to prove a point. He was the driving force behind incredible marketing successes (Date Nite at Disneyland, the Gift Giver Extraordinaire, Disney Dollars) and immense failures (USC Trojan Nite, "Lifetime" passes to Disneyland). He idolized Walt Disney, respected Michael Eisner and was scolded by Imelda Marcos. He even went toe-to-toe against 60 Minutes reporter Mike Wallace...and won. Lindquist tells all these stories--from the endless business hours to the late-night parties--with a generous combination of good humor and sincere honesty. He's a straight shooter who knows he had the coolest job around and relishes passing his experiences onto you. Reading In Service to the Mouse is like inviting Jack Lindquist to your living room to share fascinating stories over a few cocktails. He's a welcome guest in my house anytime. In Service to the Mouse is available from Amazon and at www.inservicetothemouse.com. In 2003, Disney Editions published The Disney Treasures, a hefty volume of nostalgia that chronicled in scrapbook form the output of Walt Disney's life from his Midwest youth through the birth of Mickey Mouse through the early concepts for Walt Disney World. It was chock full of photos, correspondence and memorabilia, including reproductions of original studio materials you could pull out of the book. 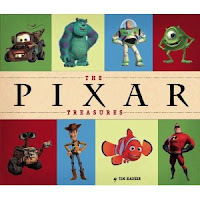 Seven year later, The Pixar Treasures takes the same approach with the little Emeryville company that could, and in many ways exceeds what The Disney Treasures set out to do, personalize a golden age of family entertainment. The Pixar Treasures has it easier by covering a shorter and more recent span of time. It also helps that almost all the major players at Pixar are very much alive. While Disney archivist Robert Tieman did an impressive job mining the vaults for The Disney Treasures, there's something cool about knowing that Pixar artist Ralph Eggleston personally turned over a copy of his 1983 hand-written note from Disney animator Glen Keane to Tim Hauser, or that Hauser, himself once a writer-animator for Disney, used his own copy of The Art of Animation for inclusion in The Pixar Treasures. Of course, all the sketches and concept art included from the likes of Toy Story, Monsters, Inc., The Incredibles and Wall*E don't hurt either. 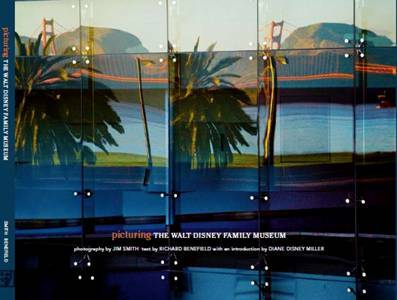 The Walt Disney Family Museum recently released its second souvenir book, Picturing the Walt Disney Family Museum. It's an ideal companion to the museum's first release, The Walt Disney Family Museum: The Man, the Magic, the Memories. While the first book focused on the major events in Walt's life, Picturing shows how that life is actually presented at the museum. Working primarily in the evening, after museum hours, photographer Jim Smith and his crew shot each of the ten galleries, capturing most of the multimedia displays and many of the artifacts. You'll see a close-up view of the earliest know drawing of Mickey Mouse, an overhead look at one of only three multiplane cameras in existence and multiple shots of the exquisite Disneyland of Walt's imagination, a three-dimensional rendering of how Walt might have visualized his original theme park in the last years of his life. You'll also see some spectacular views of the Golden Gate Bridge and San Francisco Bay taken from the museum grounds at the Presidio. 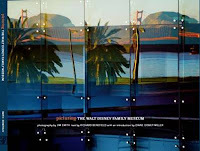 The Walt Disney Family Museum does not allow guests to take pictures inside the galleries, so if you're visiting, Picturing the Walt Disney Family Museum is the best way to take your experience home with you. And if you've never been, ordering a copy online will give you a nice taste of what the museum holds in store. It's a beautiful book.